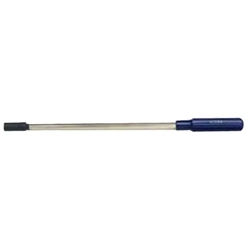 Valve Cap Tool Length 8.25" without handle Haltec TL-633 / BOWES HT TL-633. The TL-633 makes it easy to remove and install valve caps on inside dual wheels. Designed for aluminum wheels with small hand holes, it comes with a protective sleeve to prevent scratching. Also works great at removing tight or cross-threaded caps. Positive hold while valve is serviced. Keeps cap in tool. Lengh 8.25" without handle.